On Sunday, hold onto your MINI hat as we travel from Black Mountain to Historic Tryon, known for its scenic drives, equestrian pursuits and fine arts. First we will meet at Blue Ridge Biscuit Company for breakfast. Then we will follow Hwy 176 through a portion of the NC Scenic Byways with its share of twisties. Then we will rally over to see the Green River Gorge, southeast of Hendersonville and see impressive whitewater rapids along with the 224 ft high bridge that crosses the Gorge which is the highest in N.C and one of the highest in the entire US. We will make a stop at Pearson Falls, a privately owned 90’ waterfall. 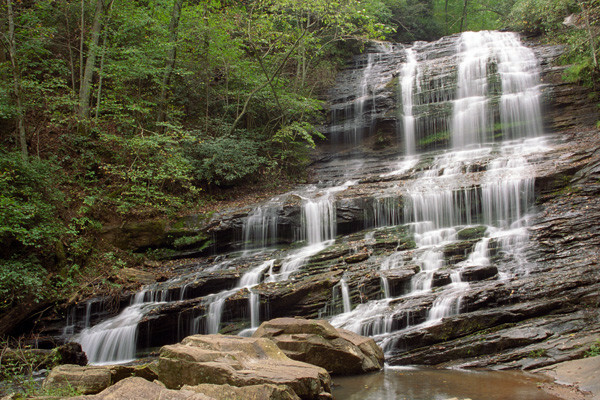 There is an easy quarter mile hike to the falls with a view of over 200 species of wild flowers and other plants. There is a $5 entry fee per person. After we view the falls, we head to the center of town to Huckleberry’s Cafe. A top rated restaurant that is the site of a renovated Sinclair Oil gas station. Then after lunch you can meet Morris, the Tryon Horse.